This page compares QR code vs Barcode and mentions difference between QR code and Barcode. It mentions QR code generator, scanning and interpretation processes. It mentions Barcode generation, scanning and interpretation processes. 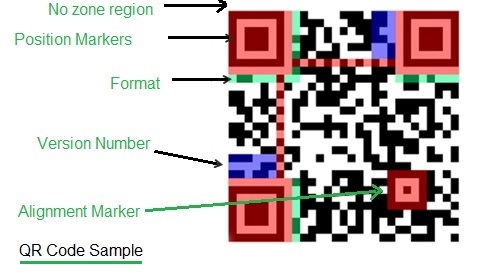 The figure-1 depicts basic QR-code with significance of it. QR stands for "Quick Response". It is 2D code which contains data in both X and Y dimensions. QR code data capacity for numeric code is 7089 characters (max) while alphanumeric code is 4296 characters (max). QR code is created by Toyota to track parts during the manufacturing of vehicles. The code can be decoded at high speed from any direction. The figure-2 depicts QR code processing carried out using mobile phone with camera and QR code scanning application. • In order to perform QR code scanning, mobile phone must have a camera. • QR reader app should be downloaded and installed in the phone. • Start the QR reader app and point the camera at the code within the designated area. • The QR code is scanned and converted to decoded information as per respective designed QR code. The QR-codes are designed for various needs such as URL or web address, phone number, contact information, geo-location with map, text etc. The example mentioned is for website address or URL. 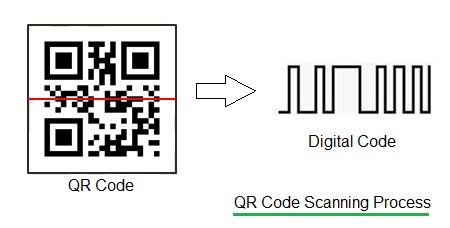 The figure-3 depicts how QR code is scanned horizontally and converted to digital data for further processing by the QR-code app. It does not require any light to be generated or to be received from the QR code as done during Barcode scanning. QR codes are generated or created using QR code generation applications available on the web. One can create by providing appropriate information to this app. It can be any one of the following. • Calendar event• Contact information• Email address• Geo Location• Phone number• SMS• TExt• URL• Wifi Network etc. The figure-4 depicts two versions of QR code viz. having 21 modules and 25 modules. 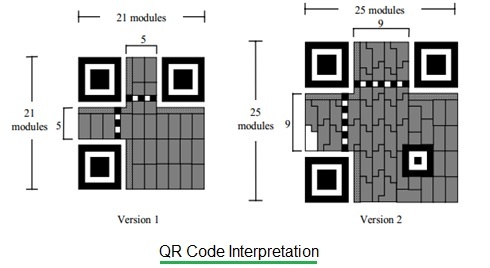 Interpretation of QR-code is that excluding no zone region, each black module is 1 bit and white one is 0 bit. Information is read, interpreted and decoded based on white modules once scanned horizontally. Before you start using make sure that QR code scanner or reader app is appropriate for your mobile phone. Test different readers or apps and also test for compatibility. There are different versions of QR code. These are determined based on numeral followed by error correction level. Due to error correction part, QR codes can be read easily even after some part is not properly read by the scanning device. 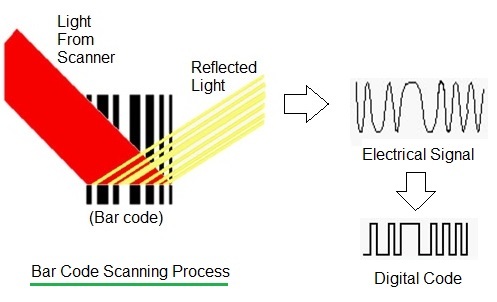 As shown in the figure-5, Barcode scanning requires special device Barcode scanner which emits light and collects reflected light to decode the Barcode. Barcode is predefined format of dark bars and white bars. The bars are structured to contain specific piece of information. It allows realtime data to be collected accurately and rapidly. • As shown in the figure-6, barcode scanner consists of three parts viz. illuminator, converter and decoder. • The illuminator emits light which is usually red at the barcode. • Light will get reflected from Barcode from anywhere which is not black. This will be in the form of wave referred as electrical signal. • The converter converts received waveform into readable format. • The decoder part reads this converted information. • The device works based on electro-optical principle. 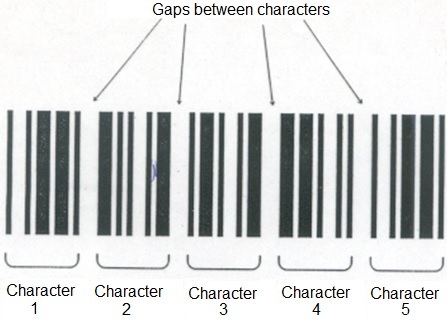 The Barcodes are created based on discrete symbology (shown in figure-7) or continuous symbology. In discrete symbology, each character is mapped using stack of dark and white bars and gaps are provided between each characters. In continuous symbology, gaps are provided after few characters are represented together using dark/white bars continuously. There are two main types of barcodes viz. linear Barcodes and 2D Barcodes. The examples of linear barcodes are code 128 (defines entire 128 ASCII characters) , code 39, UPC, interleaved 2 of 5 etc. The examples of 2D barcodes are data matrix, PDF417, Maxicode etc. All of this will have slightly different patterns to represent alphanumeric letters. There are different international standards which defines patterns for these individual codes in order to have uniformity across the world. • Code-39 barcodes use 9 bars to represent each symbol. It defines 43 characters. • The bars can be black/white. • Wide bars are 2.1 to 3 times larger compare to narrow ones. • Each symbol patterns starts and ends using black bar. • A valid barcode starts as well as ends with STAR(*) symbol. This is called as delimiter. • The STAR (*) symbol is made up of a narrow black bar, a wide white bar, a narrow black bar, a narrow white bar, a wide black bar, a narrow white bar, a wide black bar, a narrow white bar, and a narrow black bar. This is shown in the figure-8 here.